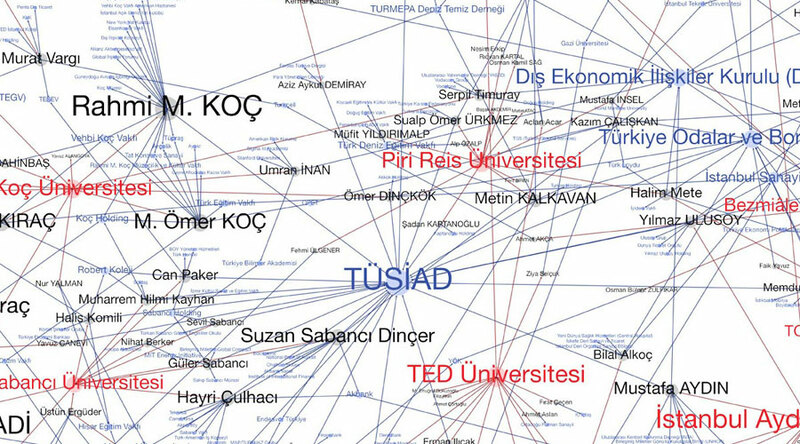 Higher Education Industrial Complex is a new work on the 68 private universities and their boards of trustees connected to a network of corporations and institutions in Turkey. The works is on show at the Koç University Campus in Istanbul, as part of the Scientific Inquiries exhibition. Curated by Basak Senova, research by Zeyno Ustun. The maps are also accessible on http://burak-arikan.com/ozeluniversiteler. Private universities and their boards of trustees connected to a network of corporations and institutions make the higher education industrial complex of Turkey. The network map contains 68 private universities (red), 625 member of the board of trustees (black), 970 organizations (blue colored corporations, foundations, associations, political parties, state universities), and 2001 relationships researched between organizations and people. Analyzing the relations between the board of trustees, which are the power holders within the universities, with other institutions and corporations; compiling a database of such information; and generating a network map of these relations, in which one can navigate from one node to the other would provide us a tool in order to understand the ecosystem of higher education in political and social terms. 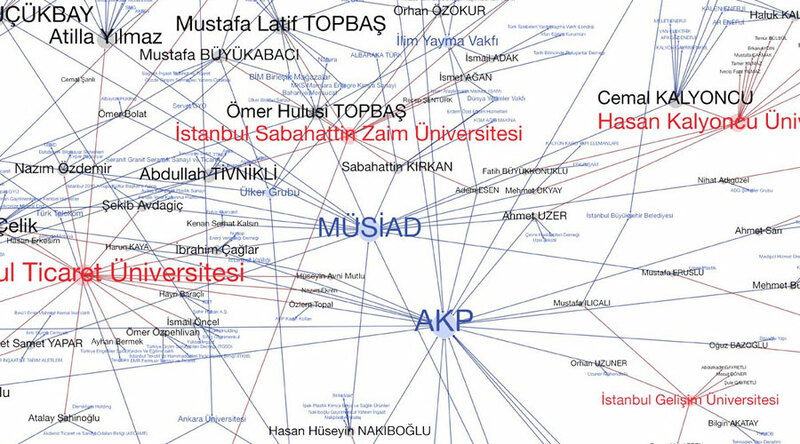 The network map of 68 private universities, including Koç University, their board of trustees, and the companies and institutions that they share, aims to reveal the ecosystem, the central and peripheral actors, their indirect connections, and clusters of industrial complex of higher education. * Images are excerpts from the map showing TUSIAD and MUSIAD their surrounding network.